The humble and traditional festive vegetable Brussels Sprouts, are a wonderful bundle of deliciousness, but so often overlooked by many and have a dreadful reputation. Brussels sprouts are at best over the winter months and has sweet, delicate and nutty flavour which some people can find bitter and unpleasant. Brussels sprouts are packed with so many health benefits, and contains numerous amount of nutritional values, and a top provider of vitamin C. While you suffer from common colds in winter season, vitamin C is a strength for you. If you want your Brussel sprouts to feature high levels of the vitamin C, be sure not to boil them. 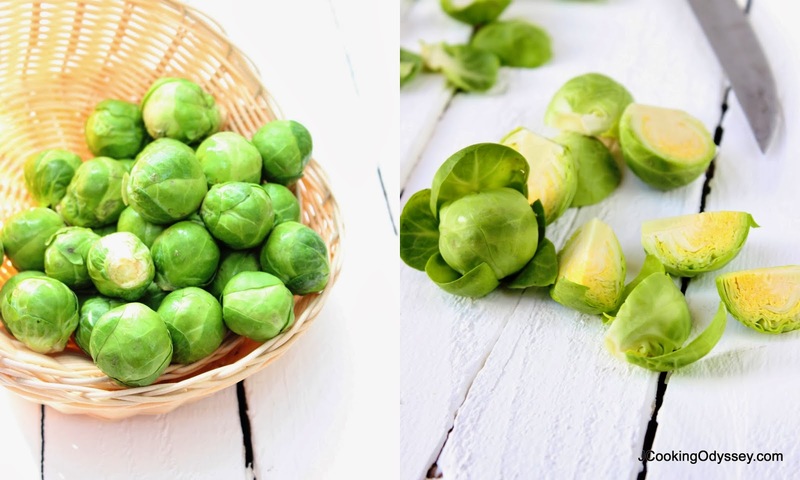 Instead, steam, stir-fy or microwave your Brussel sprouts, as these cooking methods do not cause a big loss of the anti-cancer effect of sulforaphane. As soon as they arrives in market they make regular appearance in our kitchen. 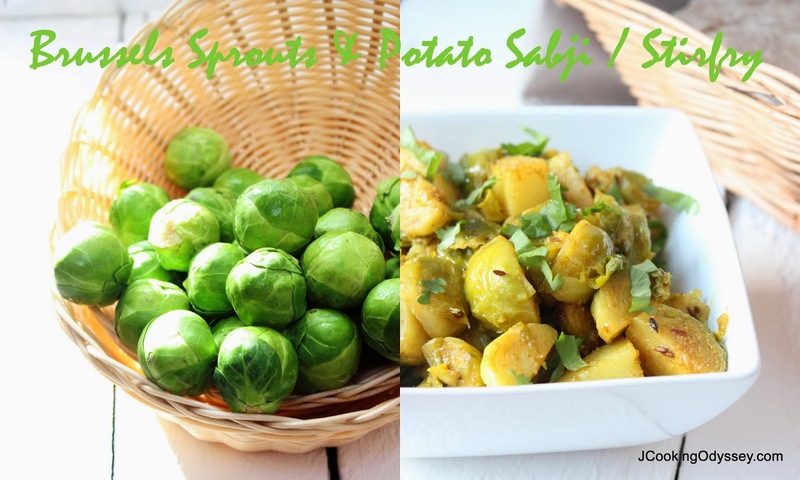 I've been using Brussels sprouts in many ways, I just do not boil them, and this sabji is firm favourite among us. Very easy to prepare and delicious, also not so overcooked , they retain their perfect texture and flavour. Still plan to pass on the Brussels Sprouts next time they are offered to you? That's okay - just realize that you are also missing out on a number of health benefits as well, I know you won't after trying this recipe :) ! If the sprouts are still on the stalk, twist each one off, trim any loose, yellow or damaged leaves, wash, then trim the base. Larger ones can be cut in quarter or halve. Peel the potatoes and cut them into same size as sprouts. wash them. Heat oil in a non stick pan and add cumin seeds, after they crackle add hing. Add Brussels sprouts and potatoes, stir for one minute. Add all the masalas except amchoor powder and coriander. Mix well and cover the lid and cook sabji on a low heat, don't add any water. After two-three minutes check, if sabji looks very dry just sprinkle 2 tbsp. water and cover with the lid. Once again after 2-3 minutes check the sabji, when done but do not mushy add amchoor powder. Mix once again and cook another minute. Turn off the heat and garnish with the chopped coriander. Serve immediately with roti, paratha and chutney. Linking this to Made with love Mondays ! awesome and tempting combo curry. Great way to cook this vegetable! Brussel Sprouts... Not everyone's favourite but perhaps with this recipe...!